It's that time of the month again, and it happens this Friday, February 25th. I'm speaking, of course, of the Fourth Friday Art Walk in historic Downtown Sanford. Sponsored by the Welcome Center, local artists are invited to display their works centered around a theme. This month the theme is Landscapes Near and Far -The beauty of the Earth and its many colors and textures. The welcome center will have the art displayed, and visitors can vote for their own favorites with a cash prize for the winner. There are also refreshments served. I ate here for the second time recently and had a nice meal. We stopped in for Sunday brunch and were immediately and pleasantly greeted by the owner/manager/hostess. Only a small table was available but she promised to move us as soon as a larger table opened, and she did. 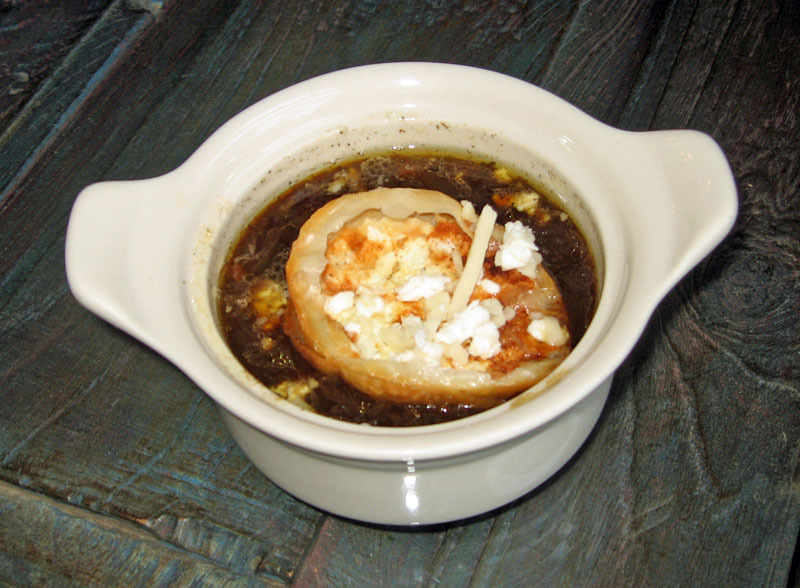 I started out with the French Onion soup and it was very good with a deep and rich flavor, not only of onion, but also of mushrooms and beef broth. It was topped by a round of toast and cheese. It was excellent and had a great flavor. I had the Beef and Cheddar sandwich, served on Ciabatta. The bread as delicious and nice and soft. 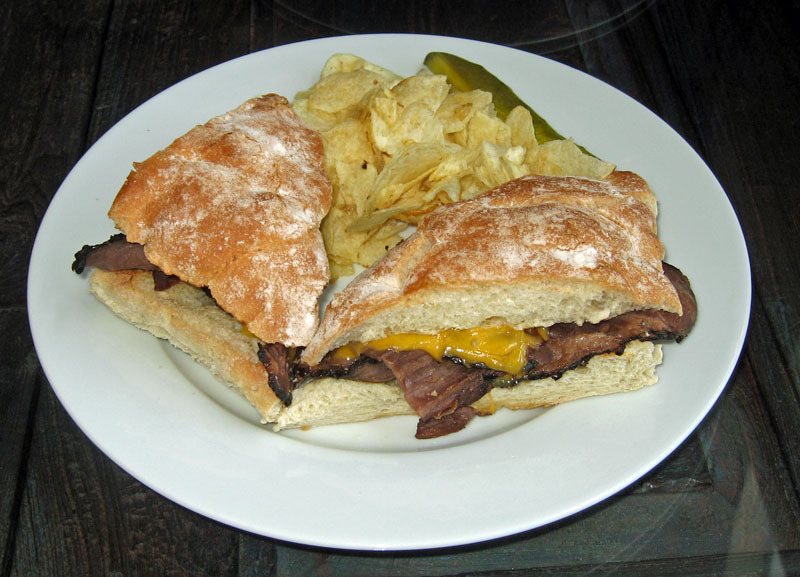 The beef and cheddar were good, though the sandwich was a bit dry. It could have benefit from a bit of jus or maybe just some mayo. Still it was tasty and I liked it. Yes, it was as good as it looks. 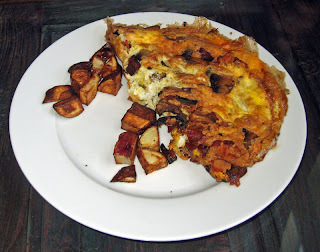 My friend Tommy had an omelet with ham and mushrooms and onions. Though it was tasty on the inside, the outside was definitely just a bit overcooked--chef must have taken his eye off of it for a second. Also, though the home fries were very good and tasty, the portion was exceedinly skimpy, barely a dozen potatoes on the plate. Overall, our meal was good and we enjoyed the meal and the atmosphere. We'll have to try dinner again sometime here. 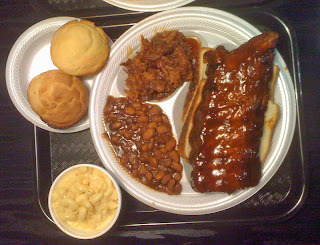 We went to Art's Southern Style Smokehouse BBQ recently and had a very nice meal. Art's is located in Uptown Altamonte. It has a nice roadhouse look and feel to it. You walk in and place your order at the counter, then sit down and they bring it out to you. We took a good look at the menu and ordered, then found a table. The meal is served on plastic plates and with plastic tableware--I was a bit weary at first, but the plastic was sturdy enough to handle the task. Ample paper towels on a roll are located at each table. We had a bit of a wait for our food, but it eventually arrived, just as we were about to check on it. I ordered the combo--two meats with two sides. For my meats I had BBQ pulled pork, and baby back ribs. For my sides i had teh BBQ beans and the Mac & Cheese.I added in a couple of corn muffins, too. I asked for an received some extra BBQ sauce, as often i find pulled pork to be quite dry, but this was not the case. 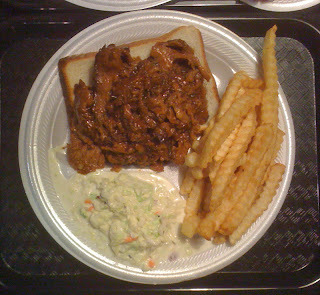 The Pulled pork was tender and juicy and nicely dressed with a sweet/sour/spicy sauce--it was very good. The BB ribs were also quite good, and i had no trouble cutting them with the plastic knife. They were not quite fall off the rib, but very close and had a nice flavor, a hit. They were served on a few slices of white bread which served to soak up any extra sauce. The mac & cheese was pretty ordinary, but the baked beans were very good. They had a flavor i could not identify, but did like. The corn muffins were ordinary. Overall, it was a very good meal, I liked it a lot. My friend Tommy ordered the Beef Brisket Platter with sides of cole slaw and french fries. First the fries were excellent, hot and fresh and crispy. The coleslaw was very good as well. The brisket was good but not the best i'd ever had. Still it was a good meal overall. The atmosphere is very nice here, nicely decorated, with soft southern style jazz music in the background. The servers were polite and friendly and kept the empty tables clean. I liked the atmosphere and the picnic-like quality of the tables and serving ware. I would come back here again, without a doubt. Overcooked, overpriced, and overlooked, that's how I'd sum up my first visit to the newly opened Metro Burger in Lake Mary/Heathrow's Colonial Town Center recently. I was hoping for more and better, but was a bit disappointed. My friend and I arrived there on a Friday night. Here's the deal, you take a pencil and fill out a form. You can create your own burger or choose one of their "house" burgers. They all sounded very appetizing, but ultimately we both decided to build our own. We made our selections, then went to the counter where the guy there entered what we'd selected into the computer. Why didn't they just have a machine to read our selections, much like voting? Oh well, we they got a beeper and our drinks and selected a seat outside to wait. And wait. And wait. Granted, we got there at the end of the diner rush, but even so the place was less than half full. We waited a full 20 minutes for our order, but then when the beeper went off, we were met by someone who was looking for us to bring it to us. Duh, we were outside. I ordered a1/3 pound burger with white cheddar cheese on an egg roll, and lettuce, tomatoes, grilled mushrooms, and straw fried onions for toppings, and a horseradish mayo ( they were out of my first choice, stone-ground mustard... come on, how to you run out of stone-ground mustard, that stuff has a shelf live of... millenia??). Now, when the took my order they never asked how I'd like it cooked. Well, I got it well well well done. So well done it was dry. I was not a big fan of this. A burger should be tender and juicy, not making you want to drink something to help wash it down. On top of that, there was no lettuce on my sandwich, but there were roasted red peppers. I don't mind roased red peppers, but it was not what I checked off on my order sheet. Strike one for the order taker. And, there were no fries. I know i ordered fries. Not a one. Now, i did the math and we were not charged for it. But don't you think that (a) the order taker would be able to adequately transcribe a written order or (be) the order taker would read your order back to you (as well as (c) ask how you want your burger cooked)? Well, apparently not. So, outside of the dry and lifeless burger (at a place with the word "burger" in its name) it was OK. 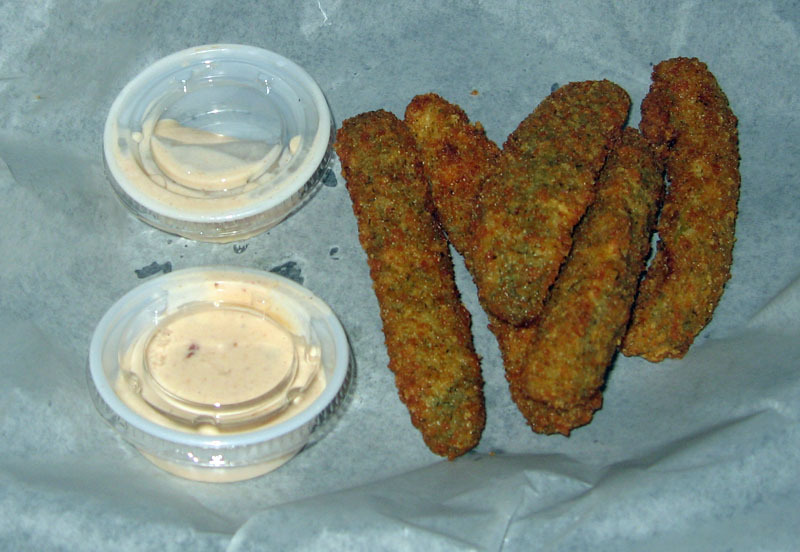 I also ordered teh Fried Dill Pickles with Chipotle Ranch. You know, they were pretty good, and certainly served very hot. There were five 1/4-sliced pickle slices that had been nicely breaded and deep fried. They certainly were served hot, too. They were pretty good. But the so-called chipotle ranch dipping sauce left a lot to be desired. It seemed to me that the chipotle never showed up to the party! Chipotle is a rather strong flavor and it should have been there--it was not. so the sauce was a disapointment The horseradish mayo that I had with my burger was better--at least by a bit. My friend Tommy liked his burger way more than I liked mine. His at least arrived the way he ordered it. It too was a bit dry and he did comment on that, but overall he liked is. He had onions rings with his meal and they were OK. They were breaded and deep fried. They were real onions and were good, but also pretty ordinary. Since this is an order and pick up at the window kind of place, it's hard to comment on the service. We did have someone stop by once or twice and check on us and ask if I needed another beer. They did ask how it all was to which i replied "it's OK." They moved on. I am not big on complaining, I want to experience a place as it normally is. 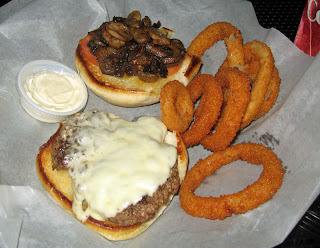 Unfortunately, I was not overly impressed with Metro Burger. Now, the place is rather new and perhaps they need a bit of time to fine-tune things. So perhaps in a few months I'll give them another shot. I can always change my urbanspoon.com vote, you know. Not bad and has potential, that's how I'd sum up my recent (first) visit to the new The Original Christo's. This location used to be a place called Angelo's, but that closed in the fall. It underwent a bit of renovation and reopened around December as Christo's. 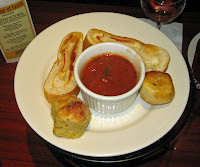 We were at the recent Fourth Friday Art Walk in downtown Sanford and Christo's provided the appetizers and snacks. The bruschetta they had there was absolutely excellent, and that alone is what convinced me to visit Christo's sooner rather than later. Overall, I'm glad I did. When we arrived on a recent Saturday evening, it was pretty busy inside. We were quickly greeted and fortunate to snag one of the last inside tables. Let me get the one disappointment I had off of my chest first, because all the rest is good: the so-called firecracker sauce. The firecracker sauce was served with (1) our appetizer, (2) my main course, and (3) one of the extra sides i ordered. My complaint: it was way too sweet. Advertised as firecracker sauce, it was hard for me to get past the sugary sweetness of it. Overall, it was not bad, it had a bit of heat and a bit of tang. But the sweetness ruined it for me, it reminded me too much of french dressing that was kicked up a notch. So, if it had been less sweet with a bit more heat and a bit more acid, it would have been pretty good. Don't get me wrong, it wasn't terrible, just too too too sweet. Now on to the good, as there was a lot. 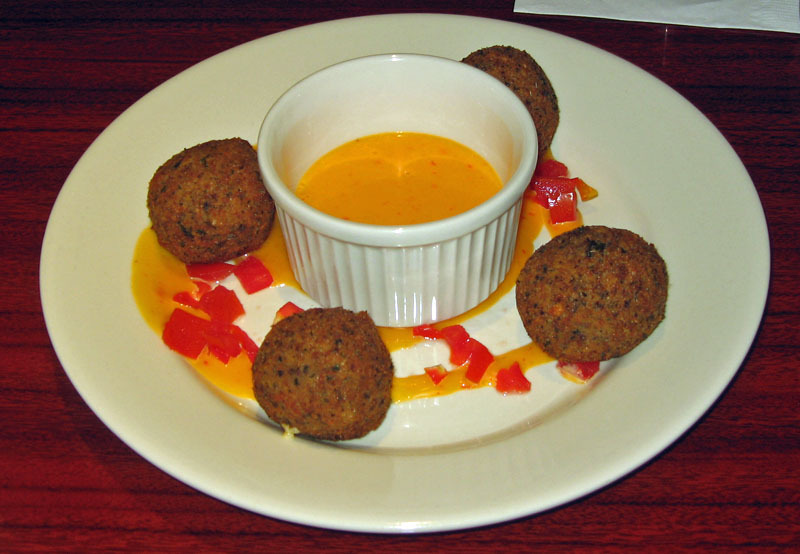 We took a quick look at the menu and decided to start off with an appetizer--Firecracker Fried Cheese. This is a four-cheese blend that is hand-breaded and deep fried. It was served with the (sigh!) firecracker sauce. Overall, these were very good. 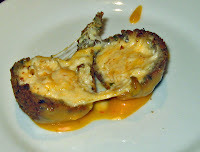 The cheese was nicely melted and very flavorful. Hey, I'm from Wisconsin and I know good cheese when i taste it. The breading was nice and crunchy and the filling good and gooey. The firecracker sauce was a nice accompaniment to these (less the sweetness). I'd order these again, for sure. I started my meal with a Salad. It was a pretty ordinary salad, but good. The lettuce was topped with some tomato and cucumber and a bit of red onion, as well as croutons. 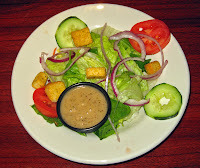 I had the citrus viniagrette dressing and it was very good. Thankfully, it was served on the side, too. For his main dish, my friend Tommy had one of the specials. 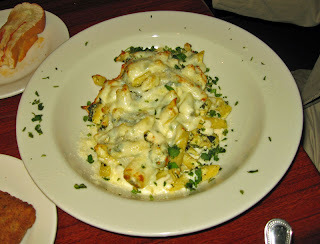 It was chicken and spinach in an alfredo sauce over what I think was penne. Tommy said it was OK, but just OK. He was not wildly crazy about it, but did take home an ample portion for another day. 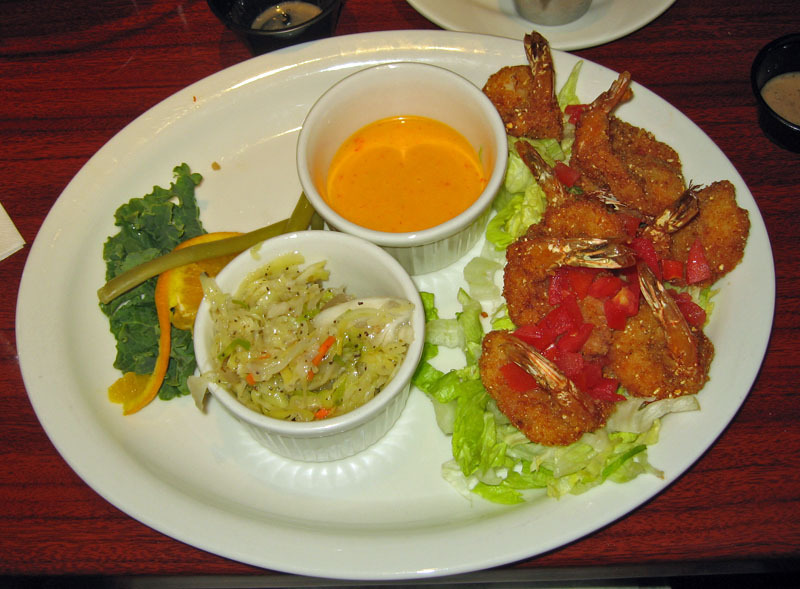 For my main course, i ordered the No Skimp Firecracker Shrimp. There were eight jumbo butterflied shrimp, breaded in kettle corn and served with the aforementioned firecracker dipping sauce and two sides. The shrimp were very good, not overcooked, but nice and tender. And the portion was very adequate. They were on a bed of romain. One of my sides was the salad, and the other was coleslaw. It was decent coleslaw and nice and fresh. This was a pretty darned good dish. But there was another side item on the menu that I was curious about, and so I ordered it: the Fried Macaroni -n- Cheese. 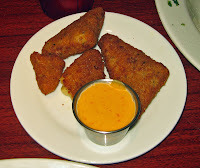 This was pretty good, little triangles of macaroni and cheese that had been breaded and deep fried. It was a bit rich after along with all the other food we had to eat, but still pretty good outside of the dipping sauce--yes, again the overly sweet firecracker dipping sauce (I think they need to work on that recipe a bit, and if they did, they'd have a real winner!). I have to mention the bread basket, too. And the marinara that accompanied it. There were two garlic knots that were nice and tender with a great flavor. And two pieces of fresh-baked pepperoni bread. This was very good, especially with the excellent marinara. A real hit. We had a very nice meal here with good food and pleasant and efficient service. They seemed to be quite busy, and that's a great thing. 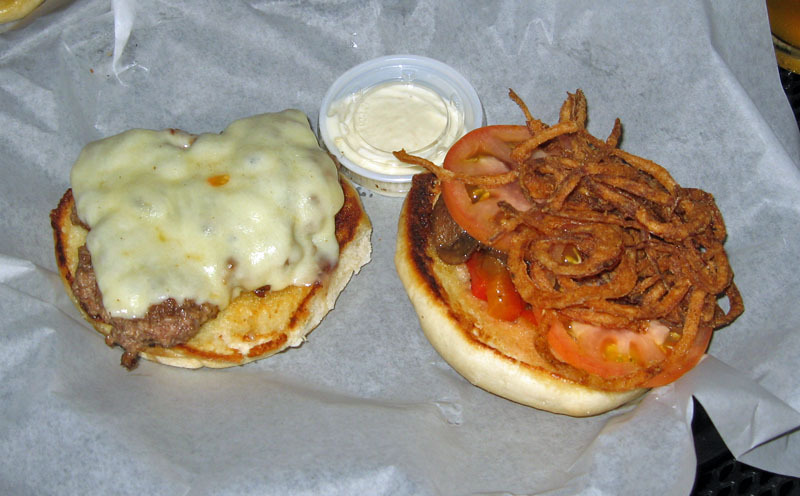 Sanford is really the home to a number of excellent places to eat. Having to choose between them all is really a good thing for us the consumers. I'd eat here again, and plan on it. I want to try their pizzas, they looked very good. Overall, definitely good eats!